New Zealand’s highest traffic blog is Cameron Slater’s Whale Oil Beef Hooked (try saying it in an Irish accent) — an aggressive right-wing sensationalist blog not noted for its delicate approach to current affairs. Unsurprisingly, Slater is an outspoken climate pseudoskeptic, with a long history of posts rubbishing climate science and the reality of climate change. This morning’s effort — The Cognitive Dissonance Of The Media On Climate Change — is pretty much par for Slater’s course, but riffs on an interesting new paper about the potential for serious additional ice loss from Antarctica which has been getting quite a bit of local media coverage (Stuff, RNZ News). These scaremongering scenarios really do show the cognitive dissonance of the mainstream media and their inability to look dispassionately at the evidence before us, instead they push political lines. All of their stories have “could”, “should”, “might” and “maybe” qualifiers. Unfortunately, Slater’s the one with the cognitive dissonance. His “dispassionate” look at the evidence is anything but, and his aggressive rejection of the new ice sheet evidence — “This report doesn’t sound plausible at all, it sounds like horse crap to me” — appears to be based entirely on his own lack of understanding of ice sheet dynamics. Picking periods of negative or no trend in the surface temperature record2 tells us nothing about the long term — in which warming is unequivocal — or about the big picture, in which heat continues to accumulate in the system. Ice melts, oceans warm, heatwaves and storms get worse. 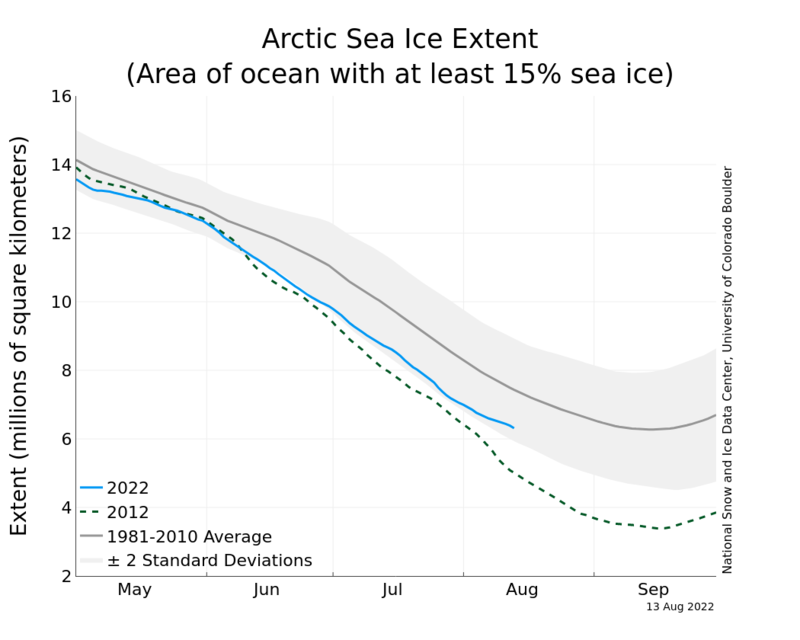 Next Slater shows the current NSIDC graph of Antarctic sea ice extent. It’s running above average as the ice heads towards its winter maximum. He doesn’t show you the equivalent NSIDC graph of Arctic sea ice, which is running well below the 1981-2010 average, or acknowledge that Greenland and Antarctica are losing ice mass, or that the world’s glaciers are melting away rapidly. Looking at Antarctic sea ice on its own tells us nothing about the big picture. In other words, it’s another cherry ripe for the picking, designed to mislead the unwary. “East Antarctica’s Wilkes Basin is like a bottle on a slant,” says lead-author Matthias Mengel, “once uncorked, it empties out.” The basin is the largest region of marine ice on rocky ground in East Antarctica. Currently a rim of ice at the coast holds the ice behind in place: like a cork holding back the content of a bottle. While the air over Antarctica remains cold, warming oceans can cause ice loss on the coast. Ice melting could make this relatively small cork disappear — once lost, this would trigger a long term sea-level rise of 300-400 centimeters. “The full sea-level rise would ultimately be up to 80 times bigger than the initial melting of the ice cork,” says co-author Anders Levermann. Warming ocean waters are already causing ice loss in West Antarctica — particularly around the Pine Island and Thwaites glaciers that flow into the Amundsen Sea, which are both likely to become “unpinned” in the same way Mengel and Levermann have modelled for the Wilkes Basin — but a lot sooner. It’s tempting to write off Slater’s misunderstandings and misrepresentation as just another example of political ideology trumping uncomfortable fact, but with his sizeable audience and hotline to key government figures such as Prime Minister John Key, recently fired cabinet minister Maurice Wilkinson and the beleaguered minister of justice Judith Collins, it’s reasonable to ask to what extent Slater’s aggressive denial of climate reality is something the government is quite happy to hide behind. They are certainly not acting as if they take the problem seriously. It shows once again that buffoons with an over sized ego and no scientific credibility to loose (because they never had any in the first place) are totally free to dish any nonsense up disguised as ‘common sense’. And of cause the right wing underbelly of the ‘my instincts are so much better than your science’ dud-heads and call-back radio addicts are soo impressed…. Slater is an obnoxious ignoramus. A “useful idiot” for that cause. Newsquawk ZB has a lot to answer for in these matters, too. Those are pretty harsh reviews and unnecessarily personal in my opinion. The post was just making the point that the public are bombarded with climate scare stories, but scratch the surface of them and they are not that scary at all. In 200 years something ‘might’ happen! Papers like this one are only published to add to the narrative that climate change will doom us all. The content actually suggests we don’t have that much to worry about. The chances of all of Antarctica melting away is bloody sero [sic], and yet these muppets still go on about scenarios that cannot and will not ever exist. This report doesn’t sound plausible at all, it sounds like horse crap to me. Perhaps it’s time to HTFU, John? …and if cosmic rays begat elves they could sprinkle us with fairy dust and we’d all just fly to work. Looking at the American websites the deniers are having a hard time. They are still there but they get dumped on every post they make. The evidence is so strong and easily available that it is hard for them to make a case. Monkton and WUWT are poor substitute for NASA and top universities. So you want to operate at Cameron Slaters level then? [Snip] You call this a science blog but you duck all the big issues. I realise we have different views on many aspects but my views are sometimes shared by people in government for instance. What is gained by avoiding these questions when you know they will have to be answered before the public will get on board for climate action? Here’s a cartoon you might benefit from absorbing, John. Gee, now it’s tone-trolling! Hands up who’s surprised? Cameron Slater and people like Leighton Smith are closed minded. They don’t see the big picture, and can’t see the wood for the trees. Moncton’s temperature cherrypick is horrendous and sad, as so many people who should know better will accept it at face value. There is a great article on climate change in the latest NZ Geographic magazine, Issue 127, May – June 2014. The article covers past climate change in NZ, and also future projections. No doubt some people will bleat scaremongering, but some issues are scary unless you are a total idiot. Monkton is paid to lie. He is also mad but that is besides the point. Do actually have any evidence for this? I agree that he is slightly batty, but paid to lie? I see no mention of Monckton in either link, so maybe you can help me. Monckton is a recidivist liar in regard to his claims about climate science. Monckton is paid for his jaunts around the denier speaking circuit to do what Monckton does best : – (re-read first sentence). Bob is dead right. The logic really isn’t that difficult, Andy. Theres little doubt of that. Leaks from Heartland named names. Typically US$1667 per month. There are a number in NZ too who are on or aspire to get on the payroll or political sponsorship. An employment history with Phillip Morris helps. Monckton’s trips around the world have to be paid for. There have been a number of exposures in the media, New York Times, Time, Newsweek. Guardian. The money has been traced back to Koch Industries and Exxon Mobil. The National Party has received donations linked to special consideration from Cabinet Ministers and deniers like Slater are linked to them. Exactly the same is going on in Australia. Fortunately the move to sustainables is probably unstoppable now in spite of the denial community. Just a glance at the global price for coal and the actions of smart industries like Cargill tells us much (getting out of coal). Denial in the face of these developments clearly exposes dodgy operators and their equally dodgy political cronies. Just like the dodgy native forest millers in Westland who struggled on only with political assistance. Cognitive dissonance sounds learned doesn’t it? Unfortunately it doesn’t mean misguided. It means troubled by incoherence or contradiction. When you refer to “leaks” from Heartland, are you referring to the documents that the chairman of the AGU ethics committee obtained by pretending to be a Heartland member? Booooooooring. We’ll remember this next time you try to run with anything from the CRU hack – should you be foolish enough – andy. Bill, I look forward as much as you do to finding out what really happened at CRU. The Norfolk plod seem to have gone very quiet. Maybe they are pursuing Jeremy Clarkson for thought crimes or grievous bodily twitter attacks? Even if coal for electricity is phased out, the other uses make up about two thirds of the total now, and they’ve been growing. Solar makes about 0.1 percent of our electricity, much less of total energy. In the US in 2013 coal produced two hundred times as much electricity as solar, and nuclear one hundred times as much. And they’re building gas turbines hand over fist. It’s easy to find pauses in the surface temperature graphs. There’s actually been several of them during the C20th but the trend continues onward and upward. It’s easy to highlight and focus on temporary counter trends. These counter trends are perfectly explicable when the absorbent capacity of the vast ocean depths and it’s currents are considered. But when you document a range of fingerprints, glacial recession, sea surface temperatures, ice thinning, ocean acidification, species distribution changes, weather extremes, sea level rise, coastal erosion and property damage, landslips, persistent flooding, draughts, forest fires, heat waves, rising CO2 levels and, rising CO2 levels with fossil fuel isotope signatures, the conclusion is overwhelming. What I think is noticeable among the deniers and subscribers to their blogs, they tend to be young and naive, they rush to back what they deem to be the winning team, and as Jonathan Haidt convincingly demonstrates, they are less open to alternative views. It’s quite easy to create a website or circle of websites that maintain a daisy chain of the same spurious concocted “evidence”. If you are looking for “reassurance” that’s enough to turn you into a “true believer”. Needless to say the bloggers know this. The “true believer” don’t. Do you have any evidence that the “deniers” are young? You can see the same pattern with the anti fluoridation brigade. A daisy chain of websites quote one another which looks like scientific referencing only it isn’t. They even establish “journals” which can be used to convince the gullible that scientific authenticity is involved, even “peer reviewed”. Alternative health treatments need not be based on sound scientific research and it is a multimillion dollar industry, even a billion dollar industry. The same or even bigger fortunes are involved in climate change denial engineered and financed by some of the most ruthless people on the planet, the mining and extraction industries. Have you got an actual video of Monckton skuttling off with a bag full of golden doubloons? John ONeill, your own citation shows a decline in coal production, import and export since 2008 -10. A glance at the following clearly indicates future developments. But googling “growth in renewable energy” under any number of nations indicate progress in spite of lobbying by Fossil Fuel barons. I recommend deniers mortgage their houses and buy shares in Solid Energy. Put your money where your mouths is/are. Perhaps you have! I have been looking at fuel types and central heating for our new house build project in the Mackenzie. There are other factors than just cost, including capital outlay, noise (heat pumps, for example), labour (chopping wood), future price shocks (oil price spikes). etc etc. I’m sceptical of most reports on renewable energy, as they tend to tout rising investment ( renewables are usually more expensive than alternatives, subsidies excluded ) or capacities built ( the capacity factor of German PV is only 11% ). They also include hydro, which is a far better fit to demand than PV or wind, and usually biofuels, which are generally worse for the environment than fossils. A massive coal plant like Drax in the UK, or some of the German lignite plants, throws a bit of shredded forest in the hopper and calls it ‘co-generation.’ The limits to intermittent and seasonal power with minimal storage are also generally glossed over, though they are evident especially in Spain and Germany. If you look at the graph for New Zealand’s coal use, you can see that for electricity it has fallen, but other uses have been steadily rising. A lot of that is probably for drying milk powder, which will be a difficult niche for renewables to fill. I actually met Gareth at one of the two ‘Keep the Coal in the Hole!’ camps I went to near Mataura, trying to block Solid Energy’s now derailed plans to dig up and burn large swathes of Southland. I have to confess I do have some fossil shares though. When a previous National government flogged off Contact, I brought some shares in an effort to help keep ownership of the dams in New Zealand. Instead the assets got swallowed by an Aussie gas company. This gives me an occasional opportunity to approve a raise in the directors’ pay. I collected a few hundred signatures to try to stop John Key selling half of the rest, with predictable results. Hey you myopic deniers! Read this. … A decision that makes the Canon Awards look stupid. Let us not forget that Slater is the man who made fun of a dead child on his blog. These links clearly show the denial fraternities cherry picking for narrow short sighted political purposes.